Austin Aries failed to dethrone the King of the Cruiserweights on the Wrestlemania Kickoff show on Sunday. Akira Tozawa makes his way to the ring followed by The Brian Kendrick. As he walks down the ramp, Kendrick explains lesson number ten: it’s not about athleticism, it’s about psychological supremacy. Good match. This had a good story within the match, all the way from Kendrick’s pre-match speech to the way the finish happened. I could see the finish coming from a mile away, but it still worked and was still entertaining. Really good match. Lorcan started off strong and fast. He overwhelmed Swann for a good portion of the match, allowing Swann to fight back from behind. There were some really good moves by both guys in this, and the way the match developed was very satisfying. Rich Swann gets on the mic and says that Noam Dar hasn’t been the one sending Alicia Fox gifts recently, Rich Swann has been doing it. Drew Gulak wonders if Mustafa Ali would have beaten Neville on RAW if he had acted more conservatively. He says change is coming, so he wanted to offer Ali the chance to be on the right side of history. Tent Seven, Mark Andrews, Wolfgang, and Pete Dunne are introduced on the stage. The UK Champ, Tyler Bate, is then brought out to the stage as well. Coming soon, a WWE Network show featuring the UK roster. Neville heads to the ring. He says that no one is on the “Neville level.” He contests the suggestion that he gouged Aries’ eye out of desperation. He did it because Aries deserved it. Neville goes on to celebrate his title defense by thanking the fans for never believing in him. They set a fire within him that caused him to rise to the level that he’s at now. He also thanks Aries for losing to him. Finally, he thanks the 205 Live roster for bolstering his reputation. Very good match. This had lots of great and unique moves and really good action. Every guy looked good in this and had multiple moments where they had the spotlight. Everyone fought everyone, so this match never really fell into the trap of having competitors pair off, defeating the purpose of a match of this type. Very well done. I wasn’t really even sure who I was pulling for, but it didn’t matter. This was just fun to watch. A good show. 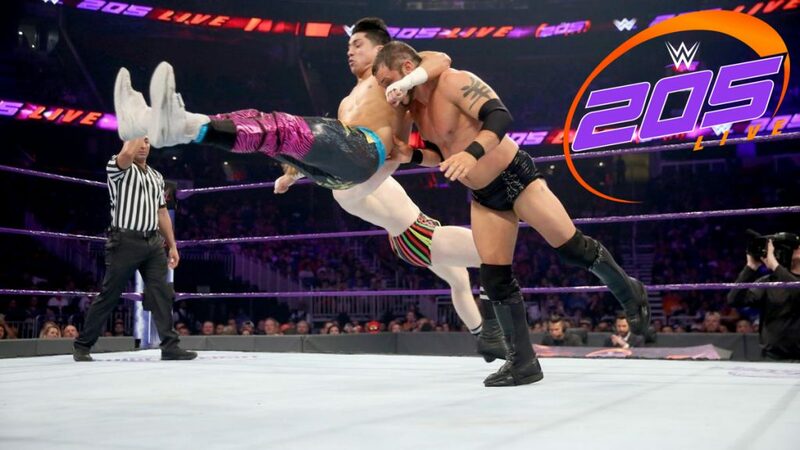 I was hoping for a big debut since this is the 205 Live after ‘Mania, but this show was still entertaining regardless (I don’t count Lorcan as a big debut). The matches were all quality, and that’s really what I watch this show for anyway. Easily the best match of the night. It had some great spots and worked very well.